Sorry. No one can come and post at the moment. Please leave a comment after the tone. 3GB left for the remainder of the month?! I can’t do it anymore. I don’t want to watch over my bandwidth usage on a weekly basis and I certainly don’t want to pay overage fees. $2 per gigabyte is ridiculous. I knowingly downloaded 17GB worth of Microsoft trials last night because they were legitimate downloads and I wasn’t going to delay my desire to learn and experiment on Windows SBS 2011. When Rogers restrictive bandwidth limits started to encroach on my learning, I have had enough. Teksavvy will get my business as soon as it becomes available at my new location. P.S – No picture for this post because I don’t want to waste precious kilobytes. The recent price drop to $169.99 for a 16GB model and $199.99 for the 32GB model got me thinking of replacing my iPod Nano 2G for one of these. My 8GB black iPod Nano is still working fine, but I think it’s time to upgrade regardless. It was released in the U.S. in September of 2009 with a very promising future, but didn’t quite make it. In fact it was just released in Canada earlier this year. According to reviews, the Zune HD fares very well in those key categories. In spec sheet comparisons, the iPod Touch 4G’s key losses were in the price and portability (size) categories. The iPod Touch 4G costs $249.99 for an 8GB model. I can get a 32GB Zune HD for $231.64 with taxes and shipping included. The Zune HD is also noticeably smaller and lighter than the iPod Touch 4G which — coming from an iPod Nano — is a big deal for me. Based on what I’ve read thus far, the only clear setback (of concern to me) for the Zune HD is the lack of a physical volume button which is a shame because not having to bring out the device to adjust volume is one of the reasons why I continue to stick with my iPod Nano. But for the improved sound quality? I think I’m willing to make that sacrifice. 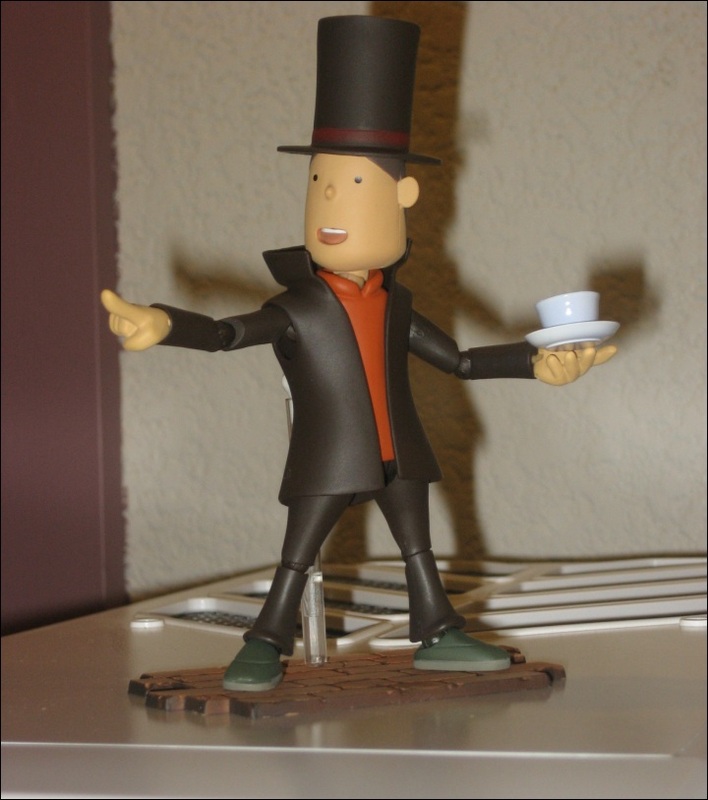 So my $20 Revoltech Professor Layton figure came in today. I must admit, this thing is pretty damn impressive. Interchangeable parts, different poses and the essential gentlemanly accessories; all in one box. Here are a few snapshots I took with my poor camera and even poorer photography skills.